Disney’s Yacht Club Resort is an excellent choice if you want to stay in a luxury hotel which is close to all of the Walt Disney World parks and within easy walking distance of Epcot. 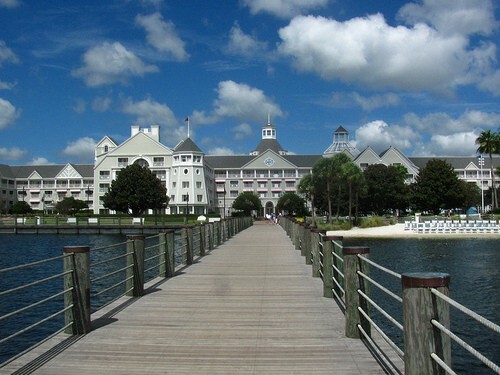 The Yacht Club is located on the shores of Crescent Lake next to it’s sister resort Disney Beach Club. Both resorts have a very upscale feel and look. You are taken back to another era of the late 1800s East Coast seaside resorts. As you would expect from the name, The Yacht Club has a strong nautical theme which is played out in all areas of the hotel. 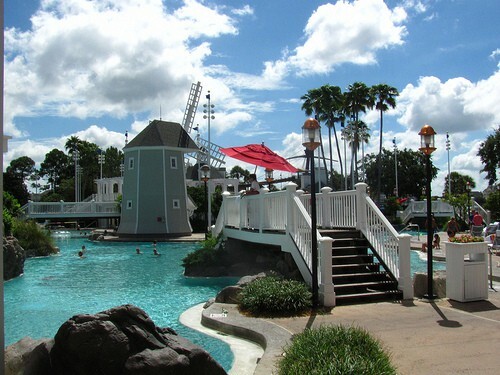 One of the best features of both resorts is that they share the very best swimming pool of any of the Walt Disney World hotels – Stormalong Bay. 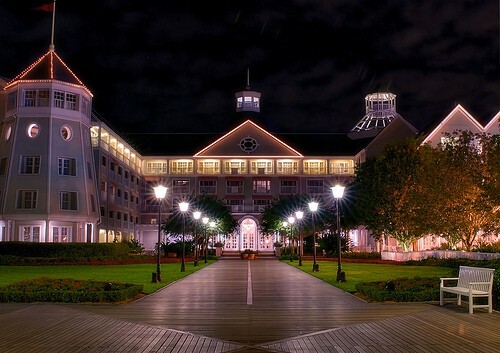 Here is a guide to the Yacht Club Resort Hotel which will give you details on the rooms, restaurants and other facilities available at this fabulous Walt Disney World resort hotel. 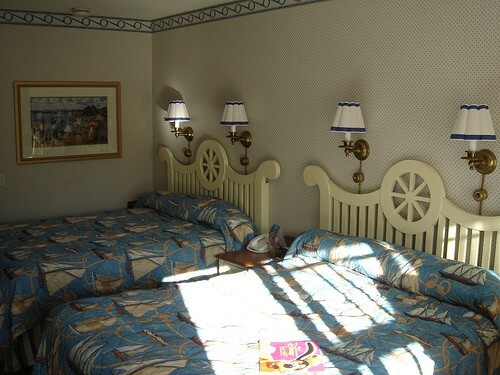 What Are the Rooms Like At The Disney Yacht Club Resort? The Yacht Club has a total of 621 rooms. The standard rooms are an average of 380 square feet. Most have 2 Queen beds and a day bed so they can sleep up to 5 guests. There are also some rooms with King sized beds but as there are only 56 of these rooms you do have to make sure you request them at the time of booking. As with all requests Disney will do their very best but make no guarantees. All the rooms are nicely decorated in nautical colors of navy blue and white. All of the rooms have either a balcony or a patio. As with many of the Disney World deluxe hotels there is the convenient feature that the double sinks are located outside the bathroom. 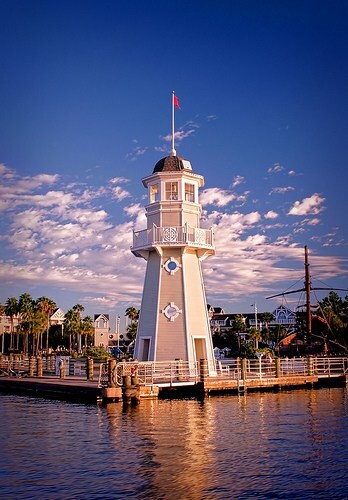 Where are the Best Rooms at The Yacht Club Resort Hotel? Guests in standard rooms have a choice of standard, garden or water view rooms. The standard rooms have a view of either the parking lot or a roof top. The Garden View rooms are a step up from the standard view and offer nice views over the landscaped areas, the quiet pool and the wedding gazebo. The most sought after rooms (which are charged at a premium) are the Water View rooms. Note that this does not necessarily mean that you have a view over Crescent Lake, as some of the Water view rooms overlook Stormalong Bay. These rooms overlooking the swimming pool are obviously less desirable than those overlooking Crescent Lake. Be aware that because of the design of the hotel even if you book a Water View you still may not get a full view of Crescent Lake. The Yacht Club also has 71 Club Level Concierge rooms and 20 Suites. All of these are located on the 5th level top floor of the hotel. The Concierge Rooms are almost exactly the same as the standard rooms with a few extra perks. As always with concierge it is a very personal choice as to whether you think these perks are worth it. If you want television speakers in the bathroom, robes and nightly turndown service then concierge rooms offer these. Of course you also have access to the 5th floor Concierge Lounge with complimentary snacks and beverages. The Concierge staff are very knowledgeable and can help you with making reservations for dining and recreation, and of course answer any questions for you about how to make your Disney stay more magical. The 20 Suites are also on the 5th floor Concierge Level of the hotel. If your budget will stretch that far then choose from a selection of luxury suites including The Turret Suite, The Commodore Suite or even the most luxurious Captain’s Deck Suite. If you stay in any of the Epcot hotel resorts you are within very easy reach of many of Disney World’s best restaurants. The Boardwalk and Epcot World Showcase are within walking distance. The Yacht Club also has it’s own excellent dining options. The Yachtsman Steakhouse is open for dinner and has a great menu of traditional steakhouse food. This is a very popular restaurant and Advance Dining Reservations are recommended. If you are looking for something a little more casual then opt for breakfast, lunch or dinner at Captain’s Grille. Here you will find the usual favorites for breakfast. The lunch and dinner menus have a good choice of American classic dishes with a particular emphasis on seafood. There are also 2 lounges in the Yacht Club. The Ale and Compass Lounge, and The Crew’s Cup are great places to sit and relax. If you want some of the best ice creams in Disney World then try Beaches and Cream. One of the major attractions of the hotel is Stormalong Bay swimming recreation area. This amazing resort pool is shared with The Beach Club Hotel and is widely seen as the very best swimming pool at any of the Walt Disney World resorts. The pool is huge. Covering an area of 3 acres and with 750,000 gallons of water this is a wonderful water playground for all guests. One of the best features is the ‘lazy river’ feature where all you have to do is float around and relax. You will also find a water slide, water falls, shallow beach entry for paddling, deeper areas for swimming, and of course plenty of lounge chairs for just relaxing around the pool. If you want something a little less noisy then there is a quiet pool with a hot tub available. Other activities include The Ship Shape Health Club which is available to Yatch Club resort guests free of charge. An excellent place for jogging is around Crescent Lake. Boat and bicycle rentals are also available. Another very nice feature here is that you can relax on the sandy beach in front of the Beach Club. There are loungers here and often there are very few people so you can feel as though you have your very own private beach whilst you relax and watch the world go by around Crescent Lake. One of the best features of the Yacht Club is of course the location. You are within easy walking distance of Disney’s Epcot World Showcase entrance. You can also take boat transportation to both Epcot and Disney Hollywood Studios. All of the Boardwalk shopping and dining venues are also just a short stroll away. Access to the other Disney parks of Magic Kingdom and Animal Kingdom, Downtown Disney, Typhoon Lagoon and Blizzard Beach are by bus transportation. Disney’s Yacht Club is a great choice for anyone looking for a Disney resort with a great location, excellent rooms and facilities. And of course who can resist Stormalong Bay? Disney Coronado Springs Resort – Should You Stay Here?